During 1999, Rev Ronnie Allwright, Rector of St Marks Church in the nearby town of Humansdorp believed that God was leading him to step out in mission to St Francis, a predominantly holiday and retirement village. As a result on Sunday December 12, 1999, he led the first service with some 12 people in attendance. This took place in a dance studio attached to a privately owned home. From an average congregation of 22 in 2000, the numbers grew, through God’s grace, to well over 120. And during the Christmas and Easter period, the combined congregations, swelled by the influx of holidaymakers, exceed 1000. Recognising that it was the only formal church in St Francis, and beginning to attract Christians from many denominations, the decision was taken in 2009 to become a United Church within the Church Unity Commission of South Africa. We currently have members from upwards of 14 different denominational backgrounds worshipping regularly with us and sharing in the amazing love of God. 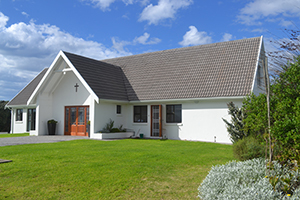 In 2010, Peter Barrett, the owner of the house where the congregation met announced that he would be leaving St Francis and selling the house. This required another step of faith and following the wonderful donation of a plot of land in the Village, the decision was made to build our own place of worship. Plans were submitted and after much bureaucratic debate with the local municipality (but fortunately a lot more prayer!) the plans were passed in June 2011. What followed was nothing short of miraculous. A local Christian construction company, Arthur Joubert Builders, offered to build at cost; numerous suppliers donated materials for free or at substantial discounts and many people came forward with financial and material contributions. Building began in September 2011 and the dedication service of a fully furnished (and completely paid for!) church was conducted on April 25th 2012. To the glory of God!